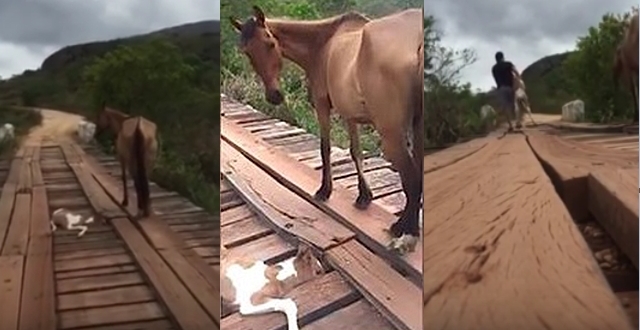 While driving down the road, this man encountered a young horse that had gotten itself stuck between the wooden beams of a bridge while its mother stood close by not being able to help. The man then wandered onto the bridge and carried the foal safely to the other side of the bridge. At first, he was baffled by the animal’s presence. But as he got closer, he realized that the the female horse was in distress… and that her baby was trapped in the bridge. NOTE: A mare is an adult female horse or other equine. In most cases, a mare is a female horse over the age of three, and a filly is a female horse age three and younger. In Thoroughbred horse racing a mare is defined as a female horse more than four years old, but the word can also be used for other female equine animals, particularly mules and zebras, though a female donkey is usually called a "jenny." A broodmare is a mare used for breeding. A horse's female parent is known as its dam. Responses to "Man Frees Baby Horse Stuck In Wooden Bridge "